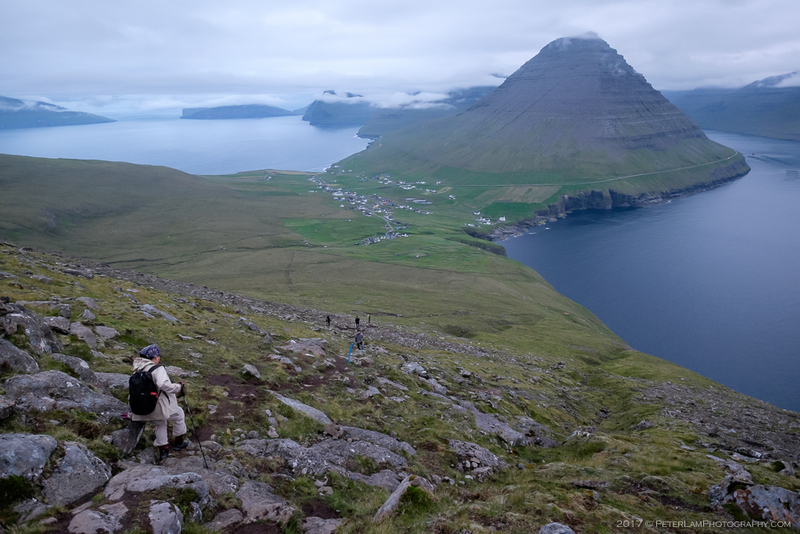 On the first day of our Faroe Islands visit, we start with what turned out to be the toughest hike of our trip. 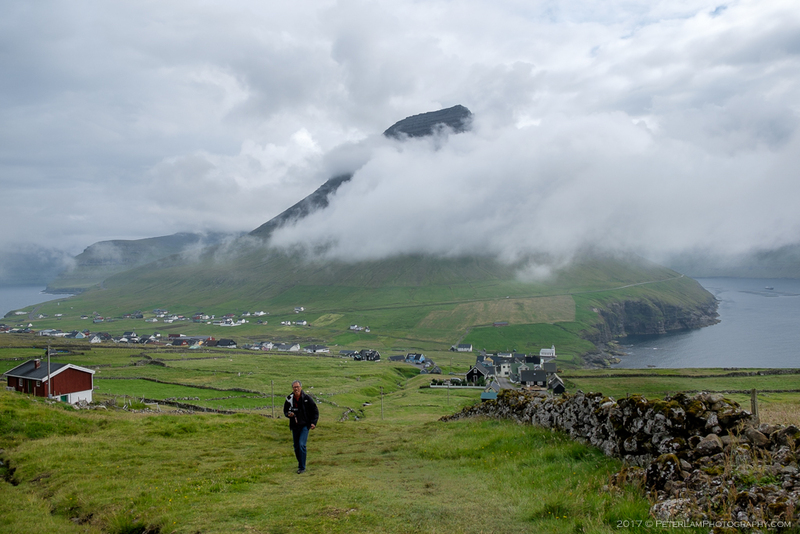 After landing at Vágar Airport and checking in to our accommodations at Klaksvík, we drive to Viðareiði village on the island of Viðoy. 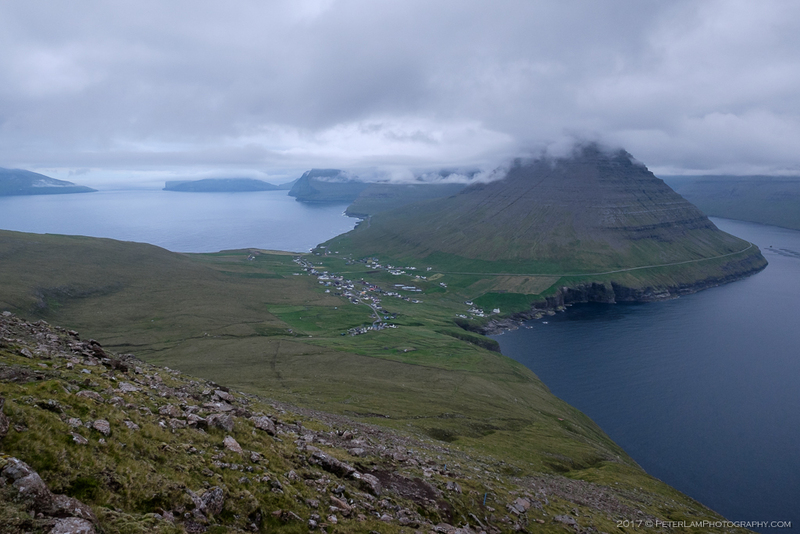 This is the northernmost settlement in the Faeroes, and our starting point for the trek to Villingadalsfjall, the third highest peak in the country (and the tallest in the Northern Isles). By the time we arrived at the trailhead, it was early evening with overcast skies but we pressed on with the ascent. 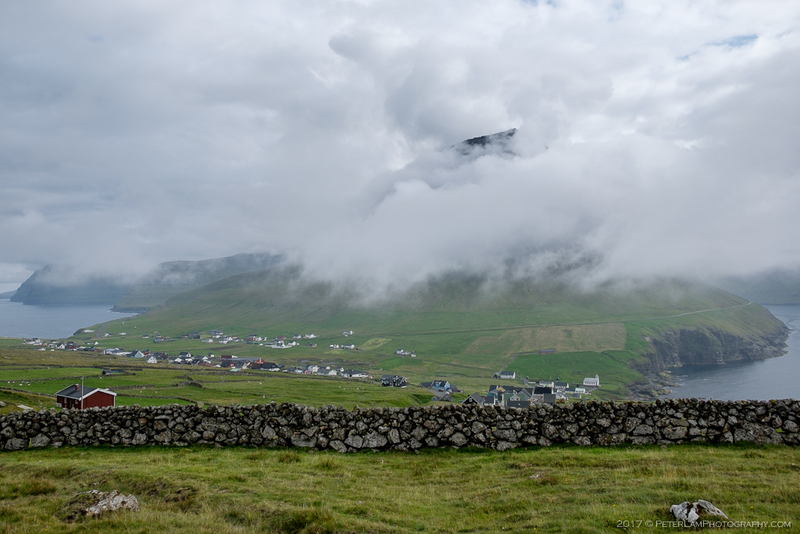 Viðareiði village seen from Villingadalsfjall. The hike started gently through soggy grass fields, through a gate to the outfield and past an ancient stone wall. Following a wire fence and blue markers, we make our way up a gradually increasing slope. 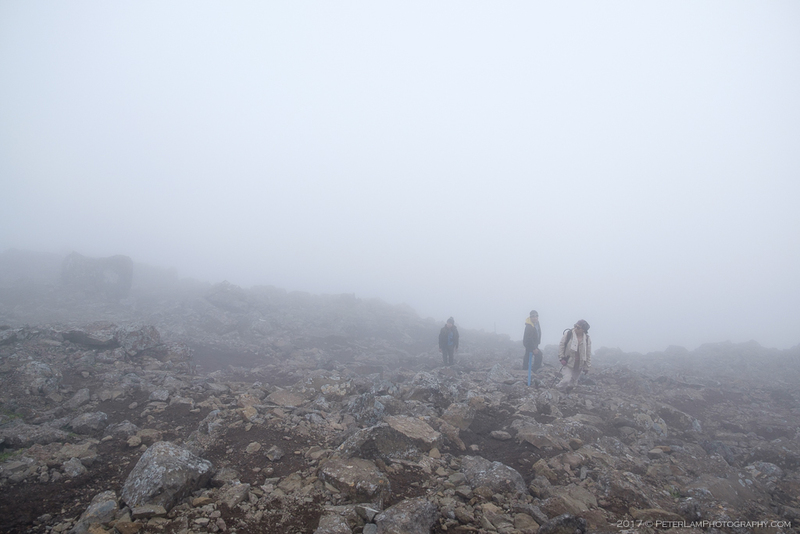 It soon became a relentless climb up steep rocks and loose gravel, surrounded by low level clouds that severely limited visibility. 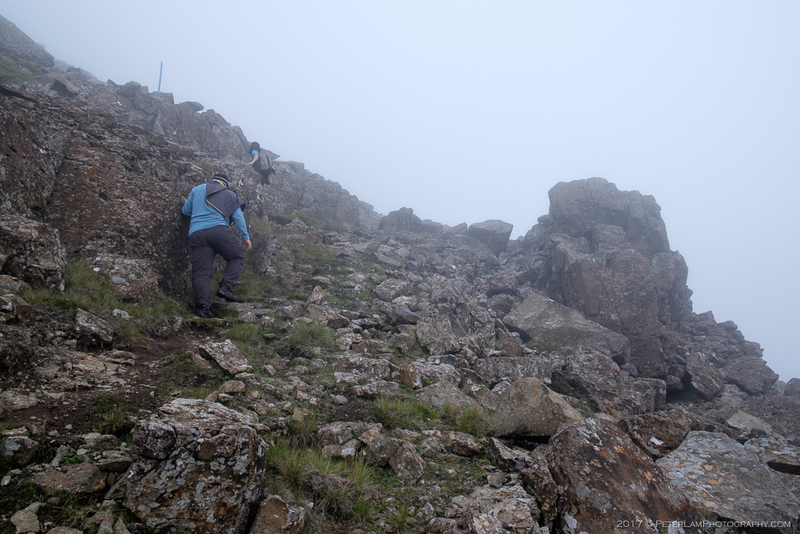 This was a challenging vertical ascent of 700m over a short distance of 2km. Apart from a few sheep (and a rabbit or two), we had the whole mountain to ourselves. 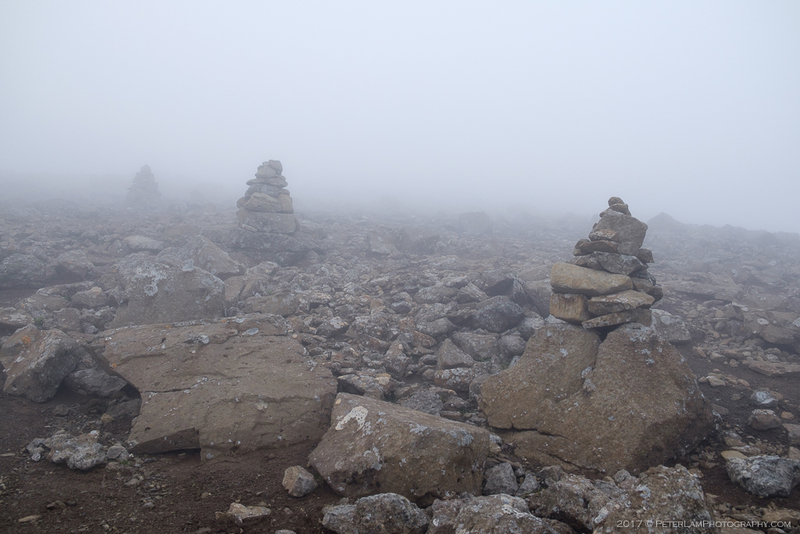 By the time we reached a plateau dotted with stone cairns (and the end of the blue trail markers), we were enveloped in mist and still 100m from the actual 844m high peak of Villingadalsfjall. With the combination of heavy fog, strong winds, and near zero visibility, we erred on the side of caution and decided to head back down the mountain – it was getting dark and the last thing we wanted was to get lost in the mist on our first day of the trip! On the way down, the clouds parted for a moment and gave us a glimpse of the valley and waters below, and we were astonished at the view – we were really high up! 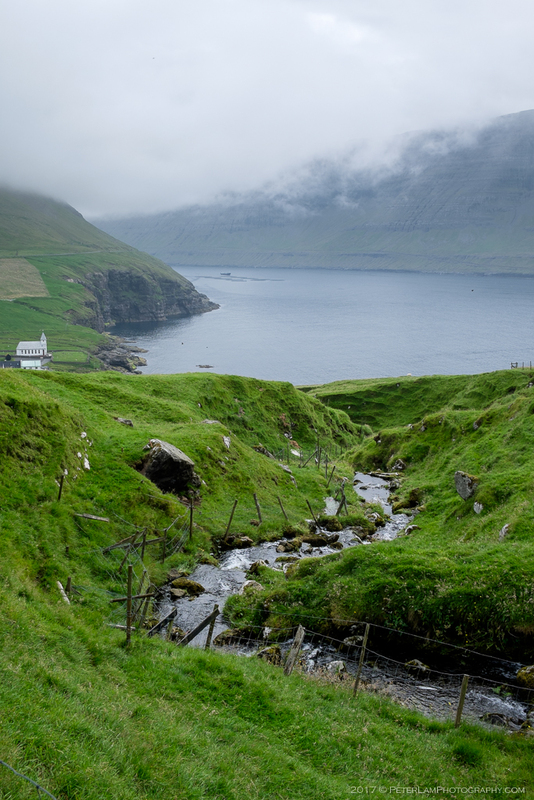 Neighouring Borðoy and Kunoy islands were clearly visible, and the village houses of Viðareiði were tiny dots below. By the time we returned to our starting point, everyone was glad to head back to the house for a good night’s sleep. We were exhausted, and this was just Day One. Near the trailhead just outside Viðareiði village. An ancient stone wall to prevent stray sheep. Making our way up the grassy (and muddy) slopes. Mountainside stream typical of the Faeroes. The terrain gets quite rocky about half way up. 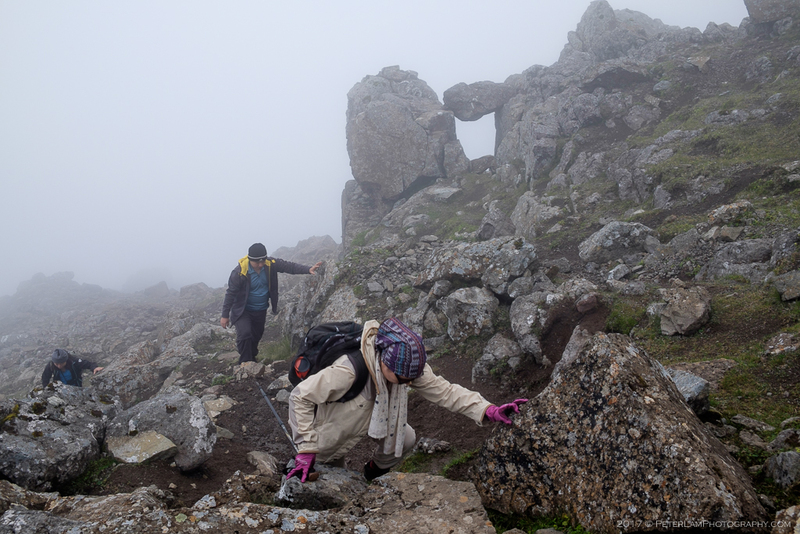 Big boulders and loose footing make this a tricky climb, especially in bad weather. Near the top, visibility is severely limited. With another 100m vertical climb, we decide to not risk getting lost in the fog. The cairns lead to Cape Enniberg, Europe’s second highest seacliff, and a precipitous drop! On our descent, we finally get a glimpse of our surroundings. 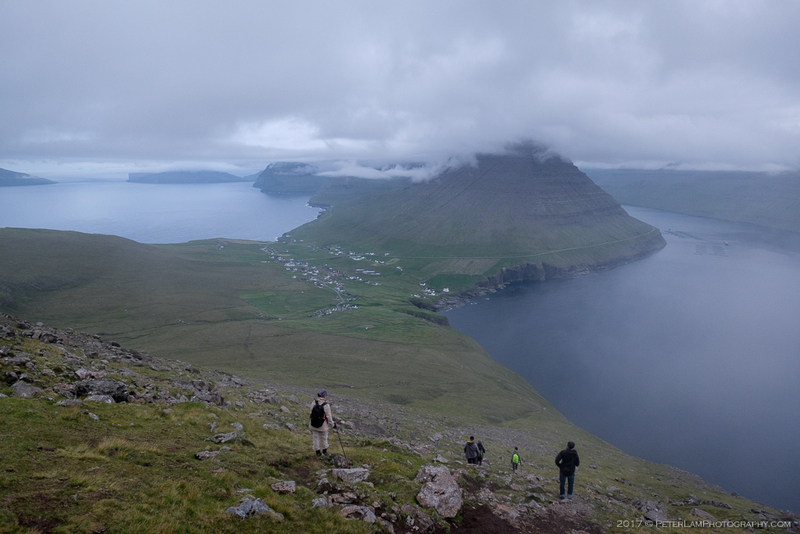 Panoramic view of our downhill trek from the highest peak of the Northern Islands. 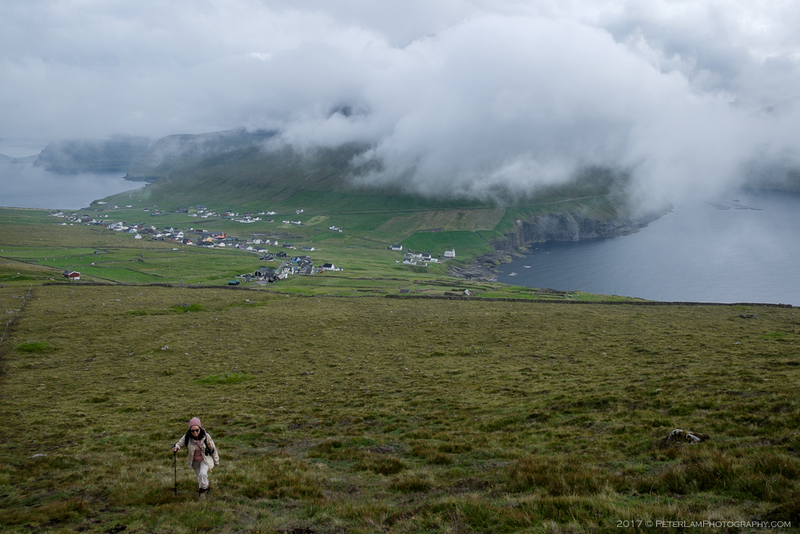 Viðareiði village far, far below. 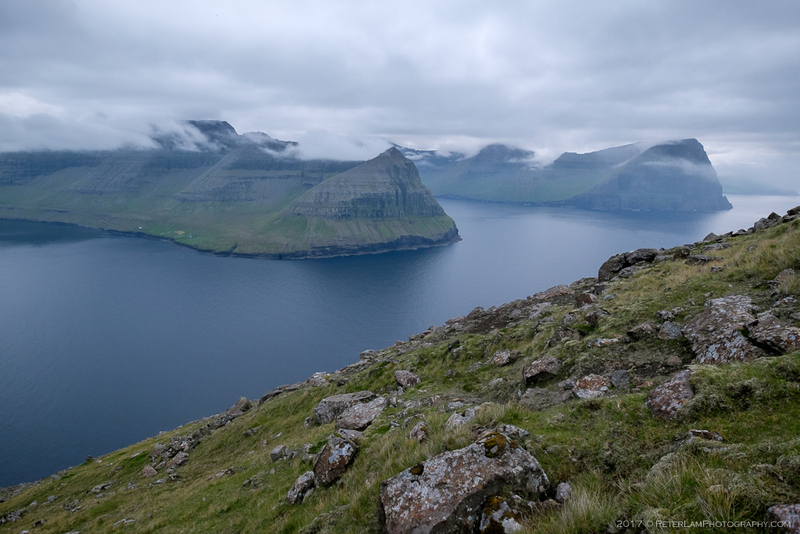 Seacliffs at neighouring Borðoy and Kunoy islands. 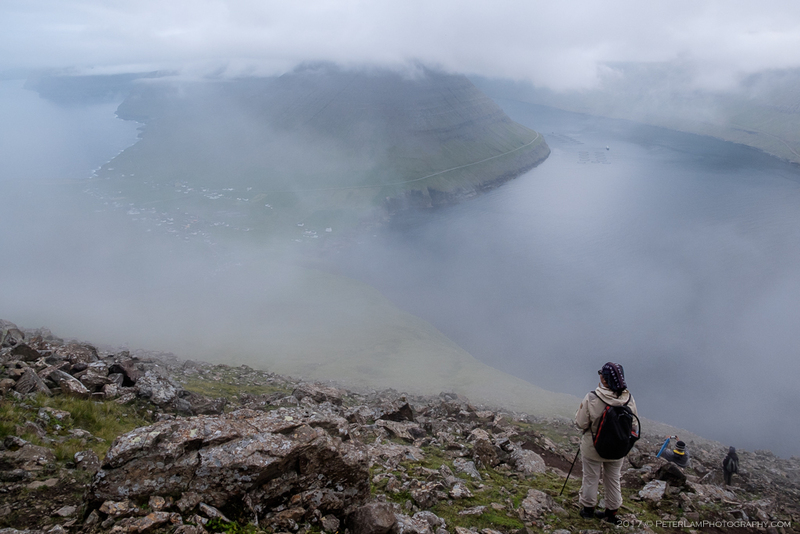 South of Viðareiði, the 751m cone shaped mountain of Malinsfjall. 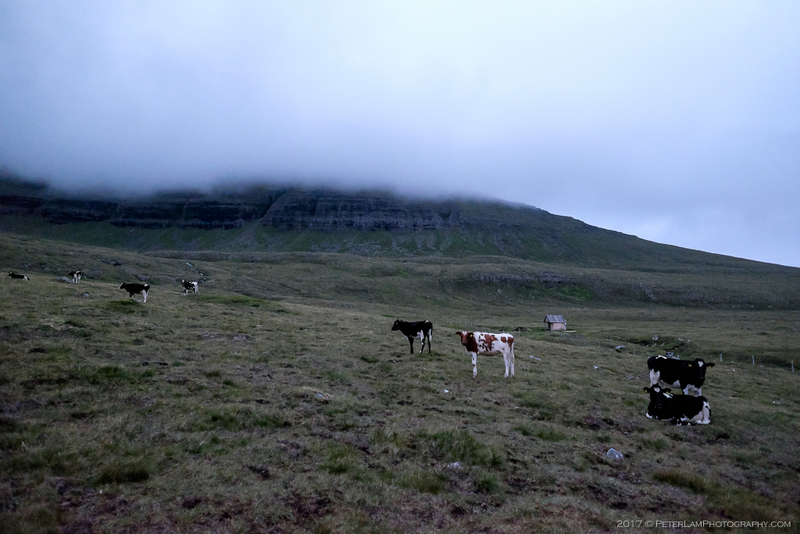 At the end of the hike, the cows came home. Literally. 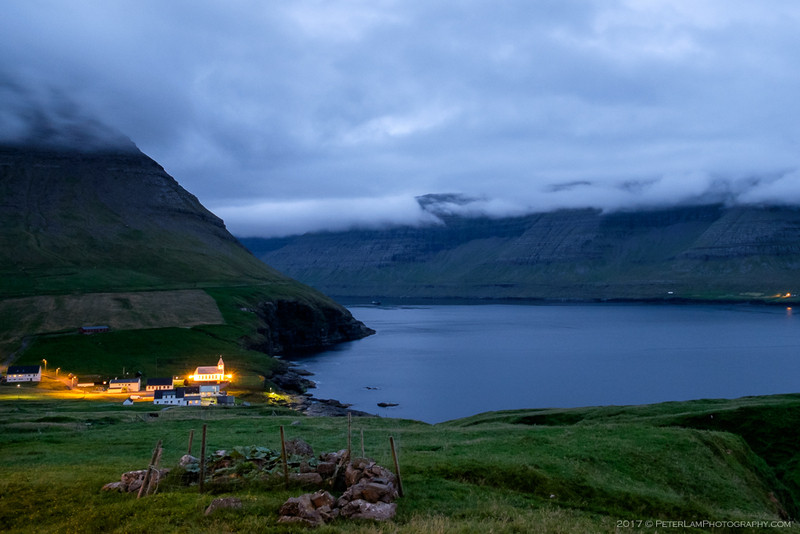 Viðareiði Church in the distance. My trip was in early August. We started the hike pretty late, so it got dark by the time we finished, and the weather wasn’t too good. This was a pretty steep hike, it was like a huge stairclimb. If the weather is clear, the view is phenomenal. Yes we had the same problem, too many hikes and not enough time. Luckily there are plenty of daylight hours during the summer, like getting two days for one! I look forward to your photos on your blog. haha look at the difference between my pic of cows and urs. i was just thinking yesterday if it was really that dark??? Cameras have night vision, almost! But yeah, it was quite dark by the time we were done.